Need more information about booking Home 8495271 ? Lovely 2 bed GFF in small block close to the beach sleeps up to 8 guests. and will sleep 2 small children/babies in 2 travel cots if required. Fully equipped kitchen, with fridge-freezer, cooker, microwave, washer-dryer. Hairdryer, Iron and Ironing board. Lovely comfy beds with with luxury linen. Towels and toiletries are also provided for your comfort. Short walk to Southbourne Beach and the local shopping parade. Beautiful 2 bedroom apartment, just 200 yards from Southbourne Cliffs. You cannot find a more beautiful location. Close to Hengistbury Head Nature Reserve, within walking distance to Tuckton, Christchurch and many other beautiful places. 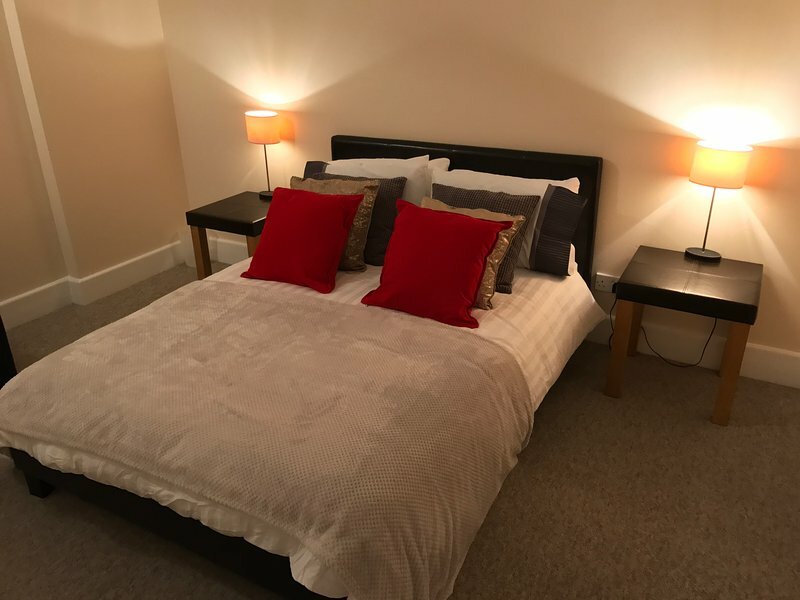 The apartment has 2 large bedrooms, one master double and the second has a full size double bed, and a further single guest bed which has a single bed hidden away underneath, if required. There is also a 32 inch flat screen tv. There is a fully equip kitchen, with everything you need, including a fridge/freezer, oven and hob. Washer dryer, microwave. Iron and ironing board, all the pots and pans and cooking trays along with lots of plates, dishes etc. The lounge has a 42 inch flat screen tv with freeview. Fast business speed wireless internet. Ikea sofa bed that can be used as a full size double, with a very comfy mattress and more than suitable for 2 adults if the extra space is needed. The apartment is very close to Hengistbury Head there is also a variety of water sports.Close to the river at Tuckton, where you can hire motor boats and enjoy cream teas. 5 minutes from Christchurch Priory and ruins close by. There are a vast amount of places to eat, tea rooms and cafes, or enjoy fish and chips. There is just so much to do and too much to list. We will provide a large amount of guides to show you everything to do in the area. The location of this apartment is close to so many places. It is fully equip with everything you need for the most fantastic break at the beach, the New Forest, the river. There are numerous gyms and fitness centres, with swimming pools. Walks and bike rides, even horse riding not far away. The Bournemouth International Centre is just a short distance into the town centre if you fancy watching a show. Just a short distance into the Bournemouth Centre, there is a new ODEON cinema with luxury seating where you can eat and watch a movie now. There are so many restaurants in the complex, such as Carter and Miller, Nando's, Frankie & Bennie, Chiquito, Costa and many more. There is transport running frequently, and you can walk along the beach into Bournemouth Town Centre. So much to do for all ages....golf, beach, town, rivers for fishing, crazy golf, boating is very close and water sports too. We will meet and greet you if possible, and we are there if you need us, otherwise we will just let you enjoy your break. No Parties under any circumstances, this is a quiet residential area. This Apartment has 2 bedrooms, 1 bathroom and sleeps 8. It’s been listed on Holiday Lettings since 31 Dec 2016. Located in Dorset, the average weekly rate varies from £1374 to £1615. The Owner has a response rate of 89% and the property’s calendar was last updated on 17 Oct 2018.